This beast caught our attention first thing in the morning. The frame is built with steel tubing. 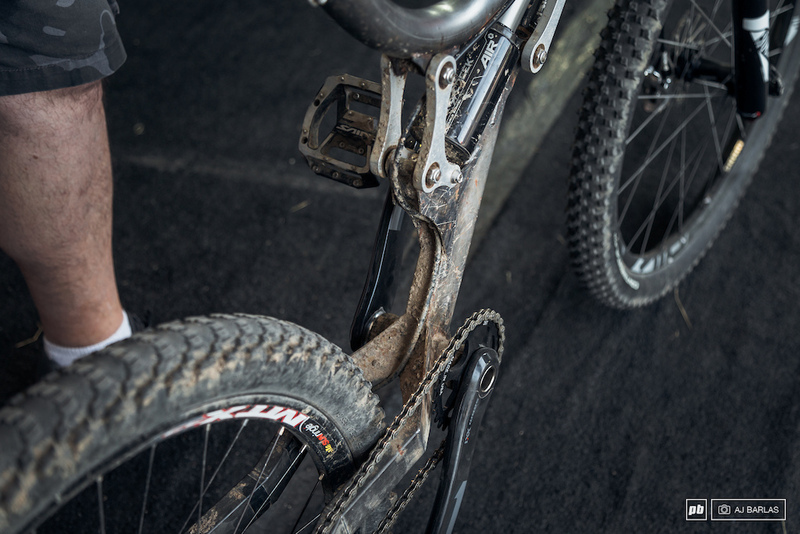 The idea behind the linkage was that it would keep the bb in the same position as the bike is compressed. 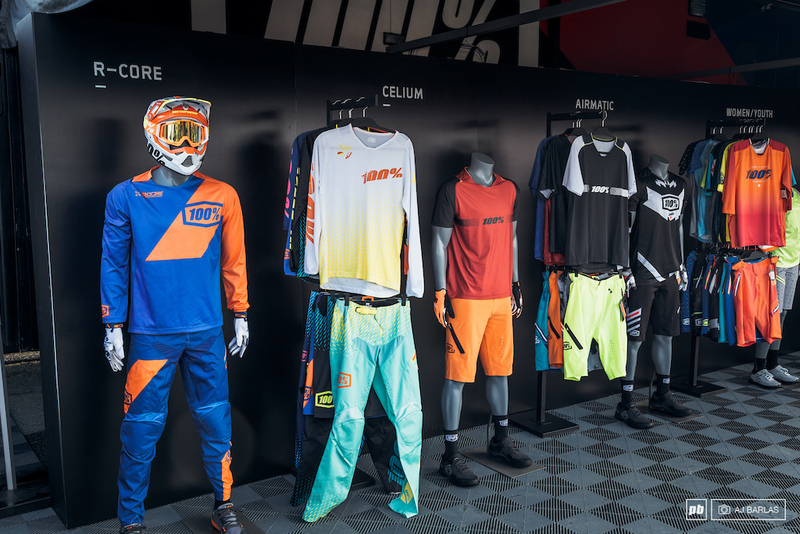 The history of Intense's M series downhill bikes, on display. Not sure what's less appropriate... a blowout of this kind or the price for such a thing. Dudes of Hazzard style name label on the frame. Custom labels for the pros. 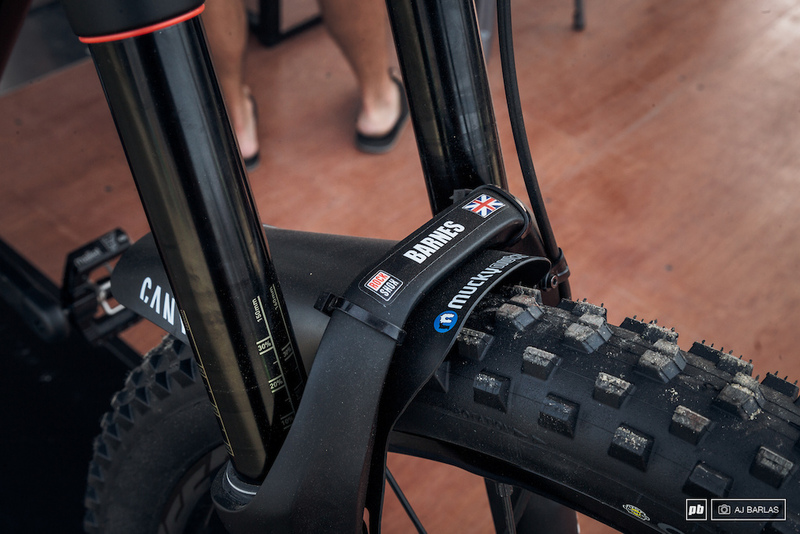 The Canyon Sender with the team kit. The World Cup team will be racing something very similar in a week's time. 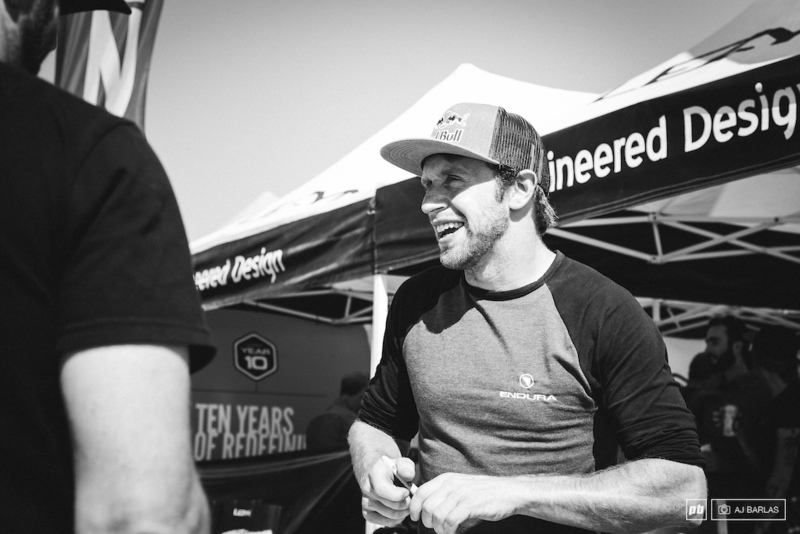 Danny MacAskill signing autographs and having a good laugh with fans. 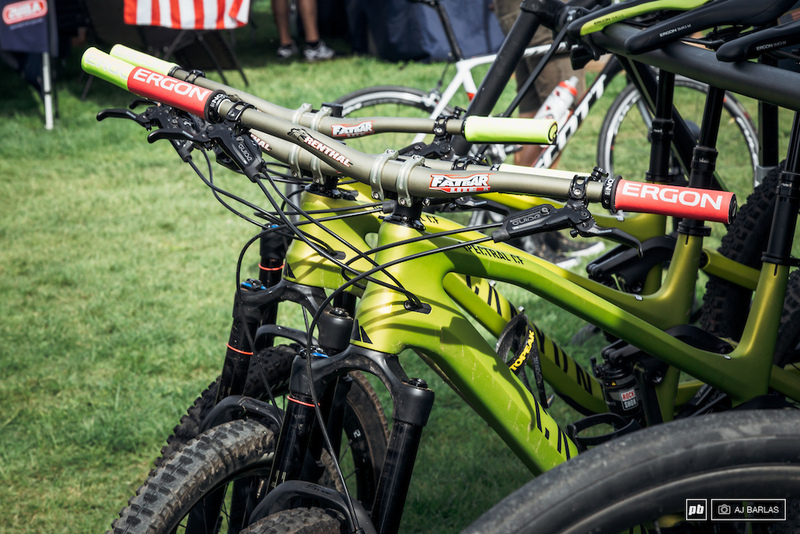 Ergon had grip warmers. Or maybe it's more like a sunhat? 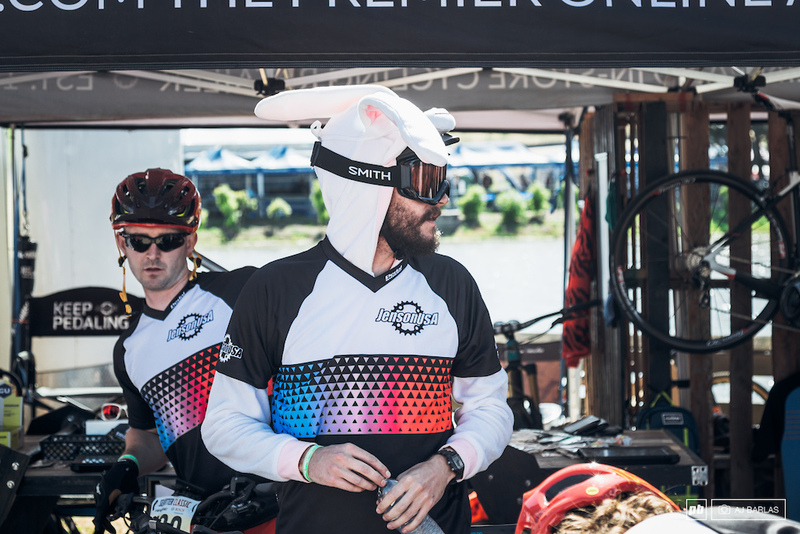 It wasn't cold, and it's not easter, but that didn't stop the guys at Jenson. 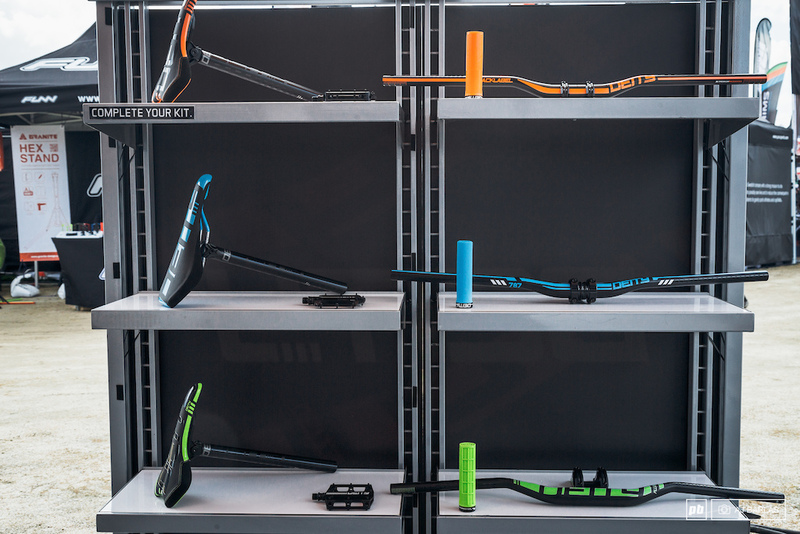 SQ Labs had their new 12-degree backsweep carbon bars on display. 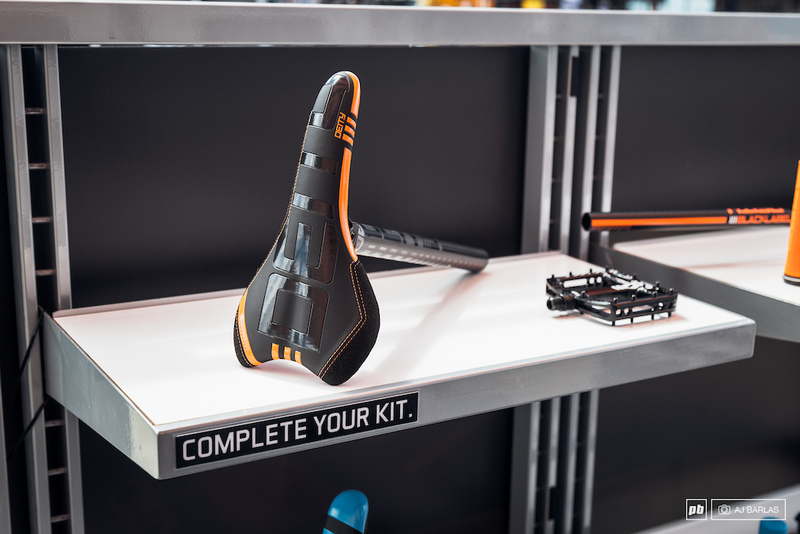 They claim that the increased backsweep provides better, more natural ergonomics when riding. The details. SQ Labs worked with the University of Frankfurt on these bars. 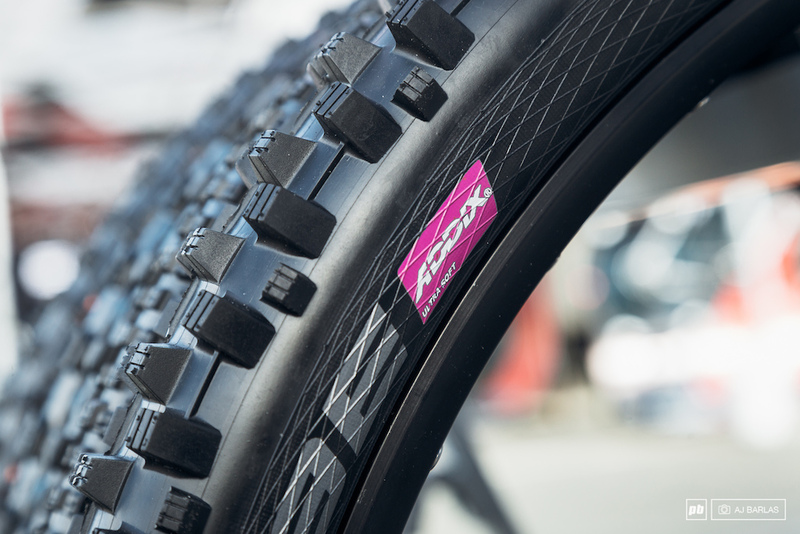 The bars feature a 4-degree upsweep and come in a range of rise options. Dayglow yellow Cane Creek Helm. 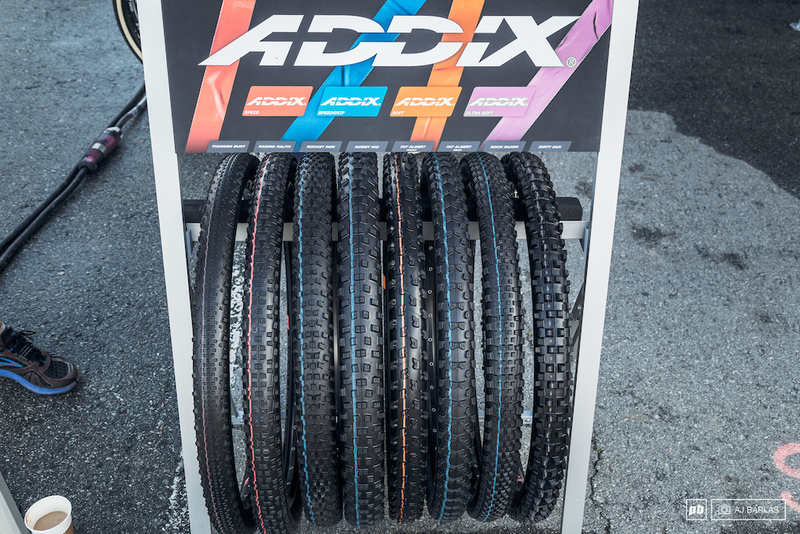 Schwalbe Addix on display for the touchy-feely types. 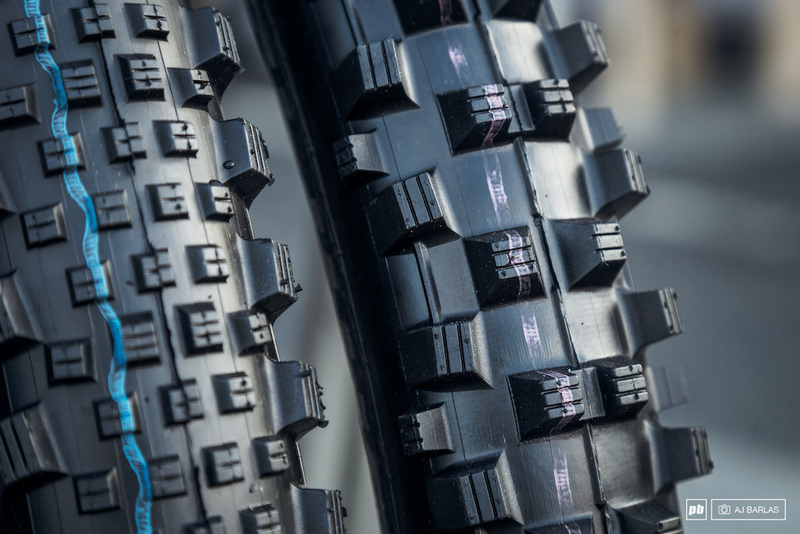 Their new Ultra Soft is said to be softer than the current Vert Star, but 12% more durable. 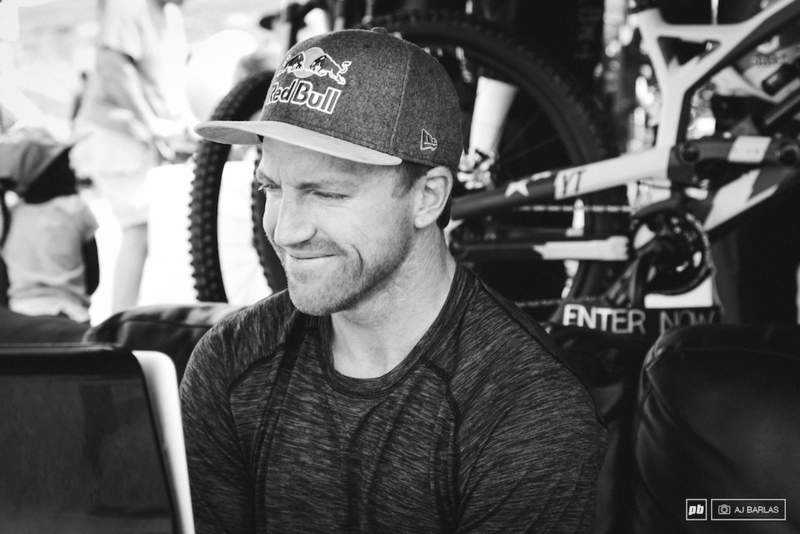 Aaron Gwin answering your questions live on Facebook, at the Pinkbike tent. Gwin was seriously having a good time, even before things really got rolling. 40+ years young and it had seen the underside of a car, but still rides sweet, according to the owner. That's an interesting looking toptube you have there. Integrated to integrated for integrated sake. 100% showing of their range of apparel. 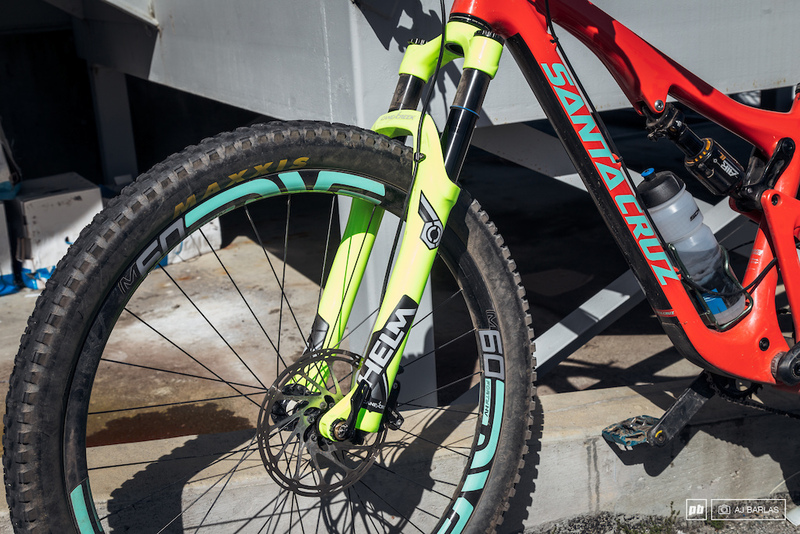 The Niner Rip 9 RDO: Push collaboration Edition will be available in eight complete bike builds, starting at $7,200 USD. 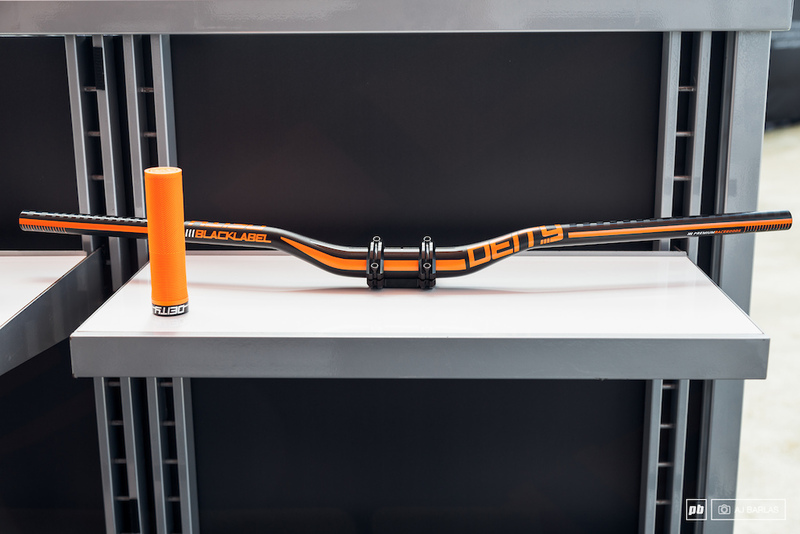 Deity's range is set to work together well, for those that want to keep things looking dialed on their ride. Can we have a compression video of that creation at the top! +1, interested to see it in action! 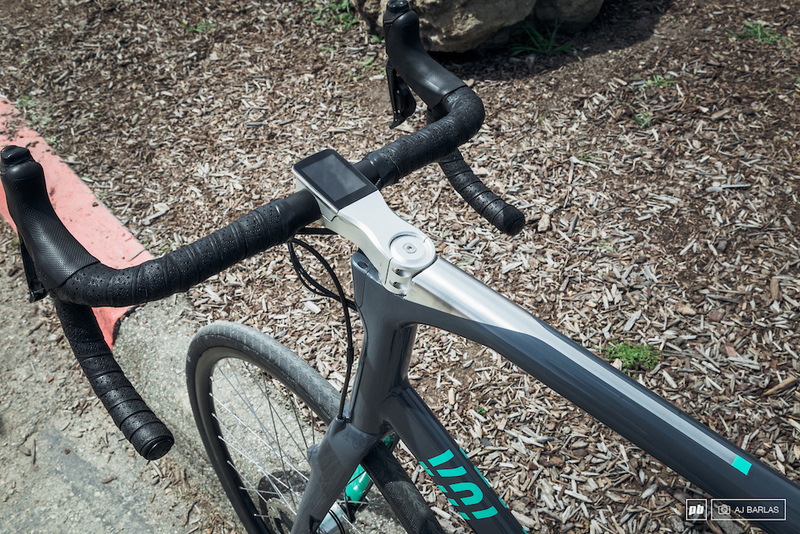 It's had a virtual pivot point at the bottom bracket axle. 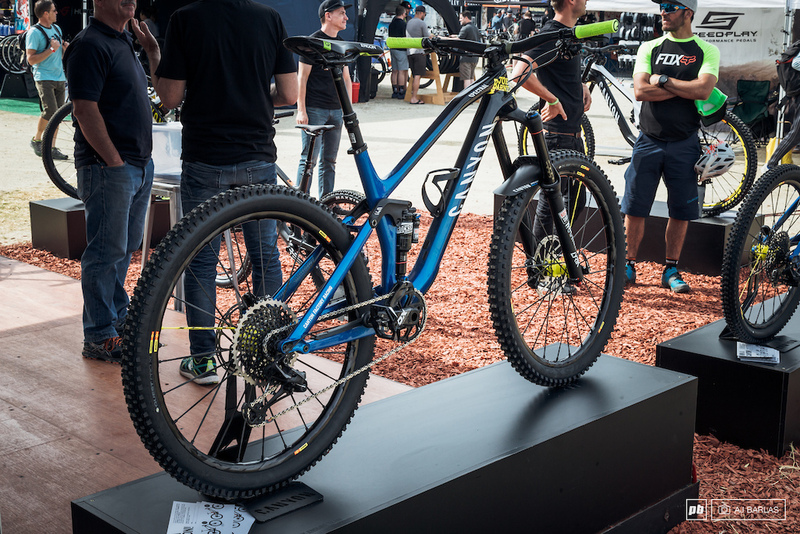 So would have the same rear wheel​ axle path as a bb pivot frame. 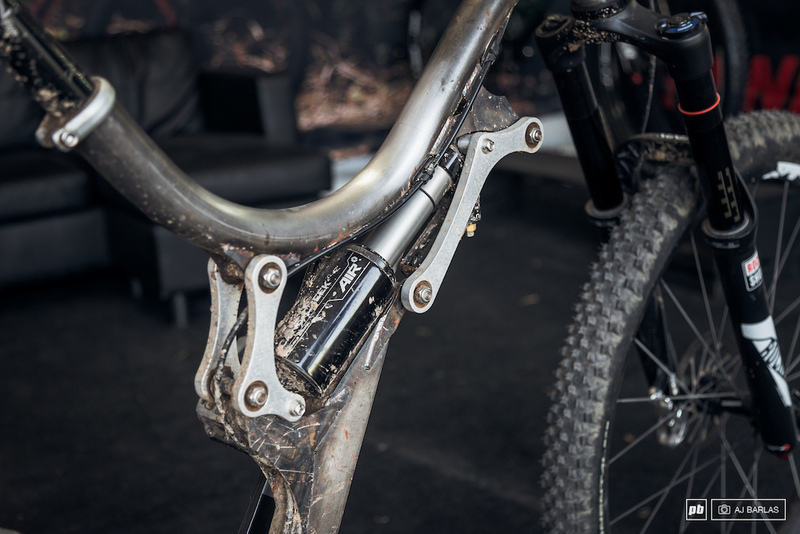 But the linkage allows tuning of the anti-squat and brake jack attributes. Which were the main downsides to bb pivots. @design:Shep rides his bike all the time NorCal Granite Bay, Folsom, Roseville area. This is not his first creation. 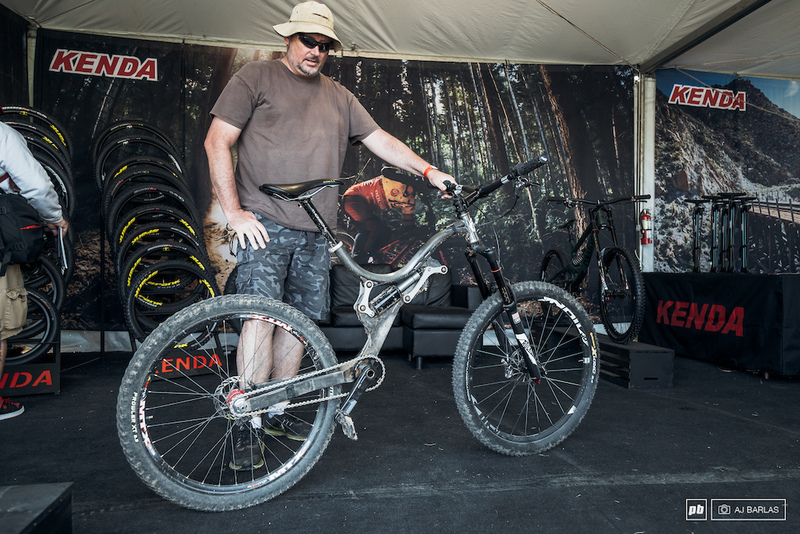 He is tweaking suspension design for many years, and brings his bikes to Sea Otter every year. Think the original linkage fork design was by a guy called Valentino Ribi and most notably appeared on Honda MX bikes in the 80's and Suzuki before that. That suspension only works when in saddle if I'm not mistaken. Rider is basically unsprung mass when on the pedals? URT will be the next big thing for 2017!!! That's only when your mass is away from the pivot. 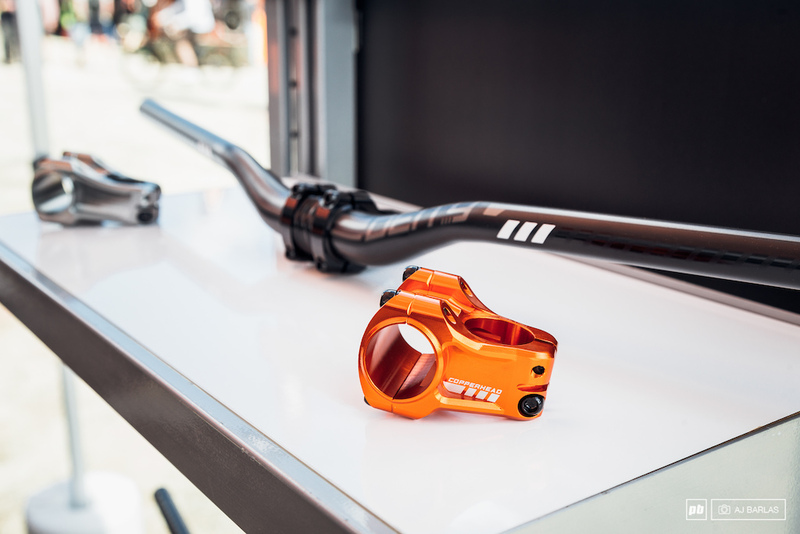 In this design the pivot is the bb axle,like. I have talket to the builder twice. Super nice and smart guy. @Bruccio: Not quite... The suspension actuates. it's just that the leverage ratio is different. My guess is that it is less active. But it will definitely sag if you stand on the pedals. It doesn't fit the classic categories of sprung or unsprung mass. The mass isn't going up and down as much as the wheel's does. But yeah, certainly not the same thing as typical unsprung mass either. @fartymarty: i wouldn't be surprised if they tried that....bet most on here would buy into it. 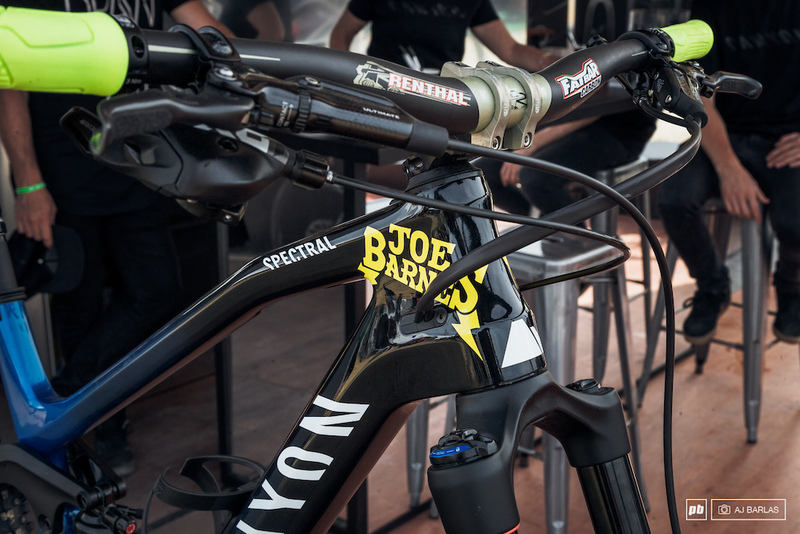 I wouldn't ride it, there's no bottle cage mounts. If that whole rack sells, I'm buying stocks in EyeBleach. 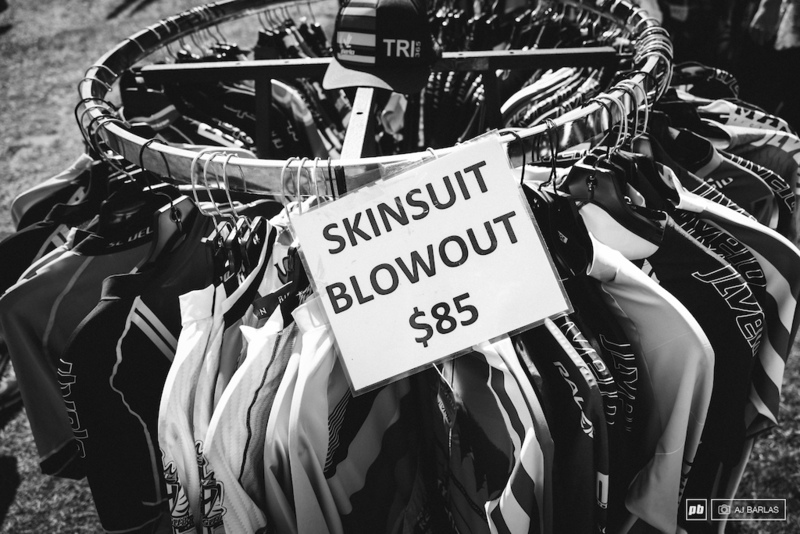 "Skinsuit Blowout" could also be service... or an awesome band name! Agreed. Looks like a fork for a department store bike. 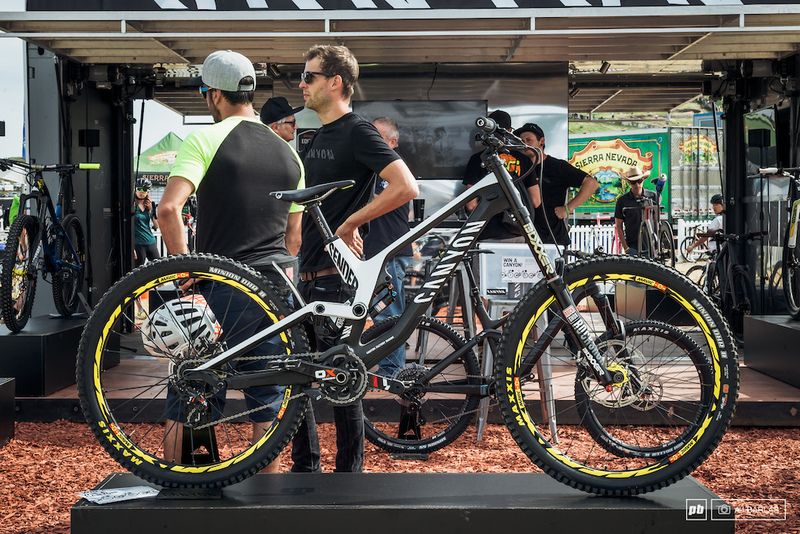 What do you say about the graphics on that Santa cruz bike that fork is mounted to? "Designed in Microsoft Word"? Or did they do it straight in fkng Outlook in a reply to "What about graphics" mail? 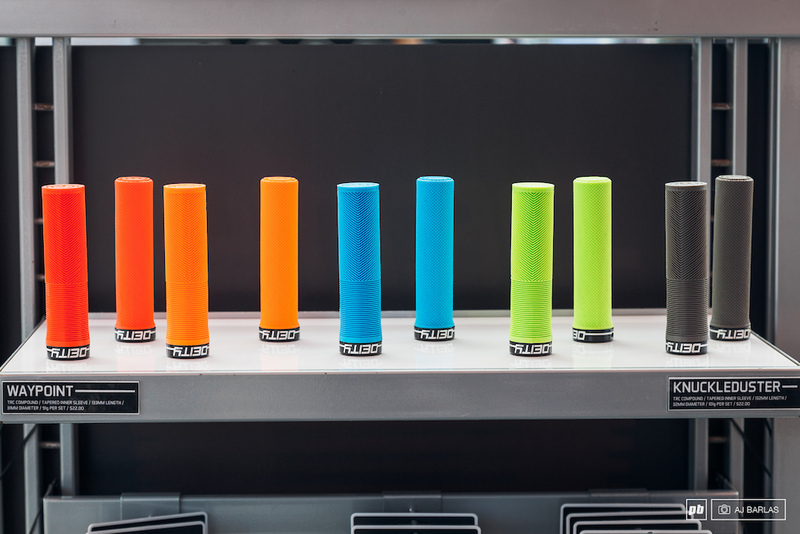 @WAKIdesigns: Clean branding is one of the harder things to get right... Santa Cruz got it right. Waiting for 2018 Saint and ZEE. 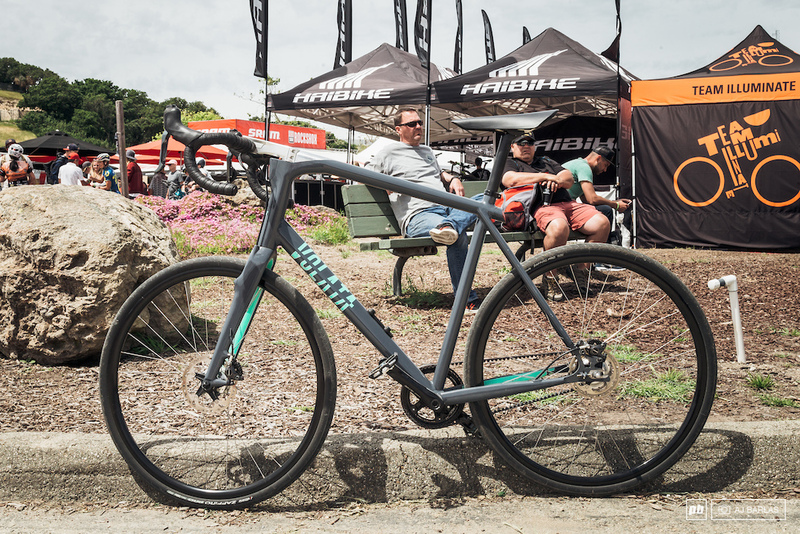 How comes all the major MTB media outlets have exactly THE SAME "randoms" bike expo after bike expo? What's the point on calling them "randoms" if they have been already selected by the main sponsors? 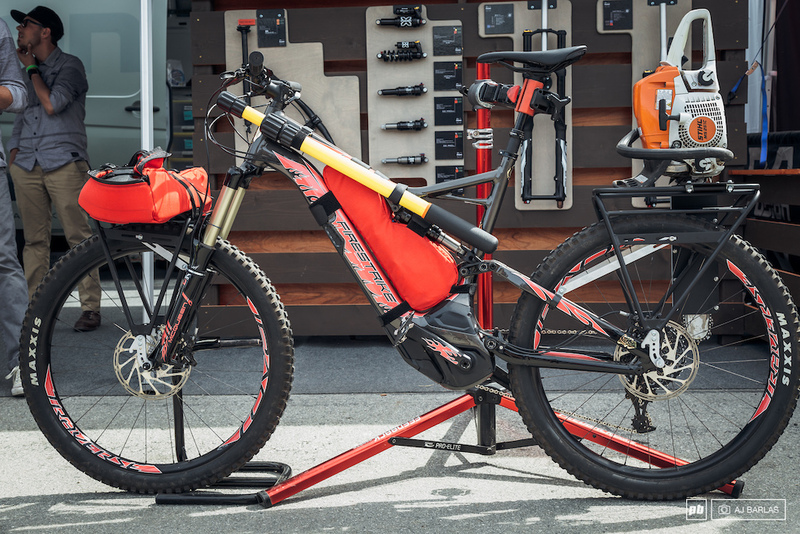 Seriously guys, if you want to differentiate yourselves from the rest of the pack, start looking a bit more at the odd contraptions and outsiders. Or maybe you are just fulfilling your propaganda contracts out there. something about "skinsuit" and "blow out" in the same picture makes me laugh. Yeah, and they were "well hung" on a "nice rack". Been riding Syntace 12degree bars for a while now and it makes total sense. The wider the bar, the more backsweep needed and less angle correction at the wrists. 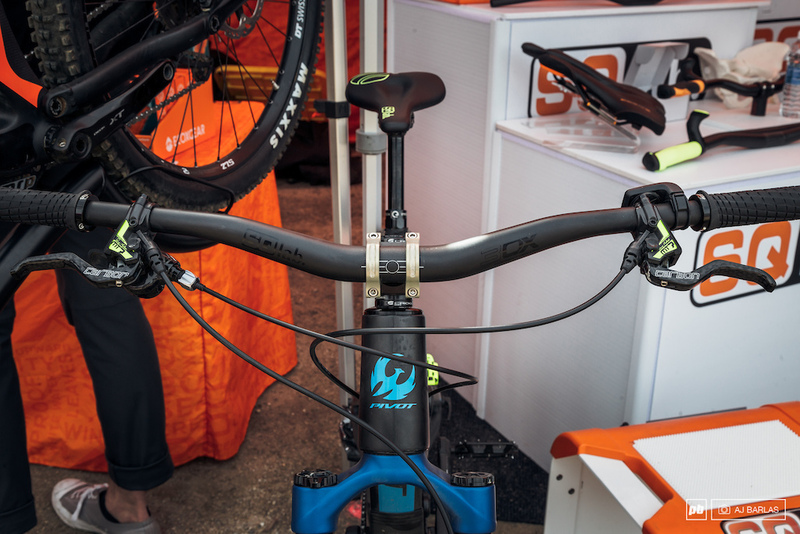 Me too, love my Syntace bars - glad to see more options out there. Wider bars naturally need more backsweep ... at least according to my wrists. Not sure why the industry is still fixed on 5deg backsweep. If you need 12 degree backsweep not to feel uncomfortable, then your bars are way too wide for you. Although, it can be way to go for the girls in the sport. They have much narrower shoulders and more backsweep can give them possibility to have healthy wide bars. In my opinion the style of riding is important, too. More relaxed, upright on a tour I think a little more backsweep seems apropriate. If you're pushing hard with the shoulders over the bars less backsweep feels better. @Brightside: there we go. That's nails it for me. Funny, I am not happy with my 7 degree BS Spanks, so looking for something around 5 max. and 760 mm mim. Nah, i wanna see jeffs prototype-new stuff thats out there(temecula). One of the best moments this weekend. Watching a random dad with his son stop Aaron Gwin walking through the expo and Aaron neeling down and chatting with the young boy for several minutes. It made that kid's (and his Dad's) day. A true class act. Hey PB. 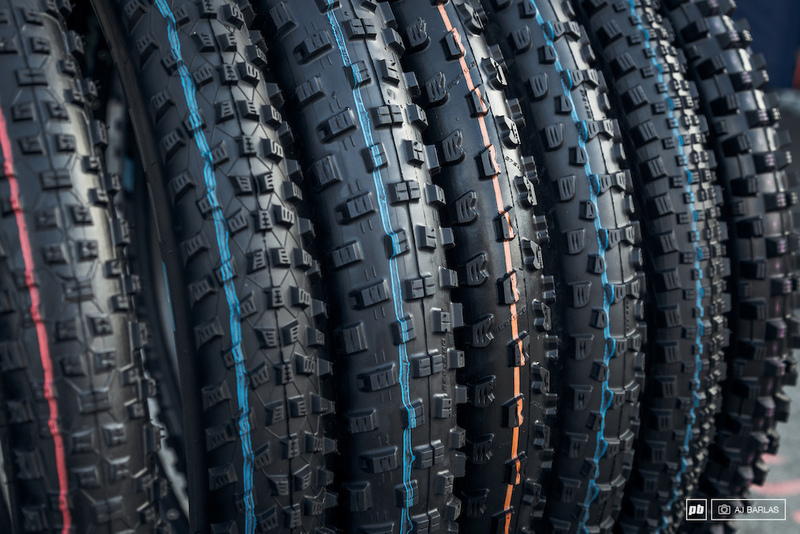 They're not grip 'warmers'. They're to protect the grips from the grime/grease/oil on the mechanic's hands as he works on the bike. 8 build kits STARTING at $7200? Wow. "Peddle"? Are you kidding me? The bike at the top is a perfect example of someone who has filled all their brain cells up with engineering ability but doesn't have enough left to use it wisely. 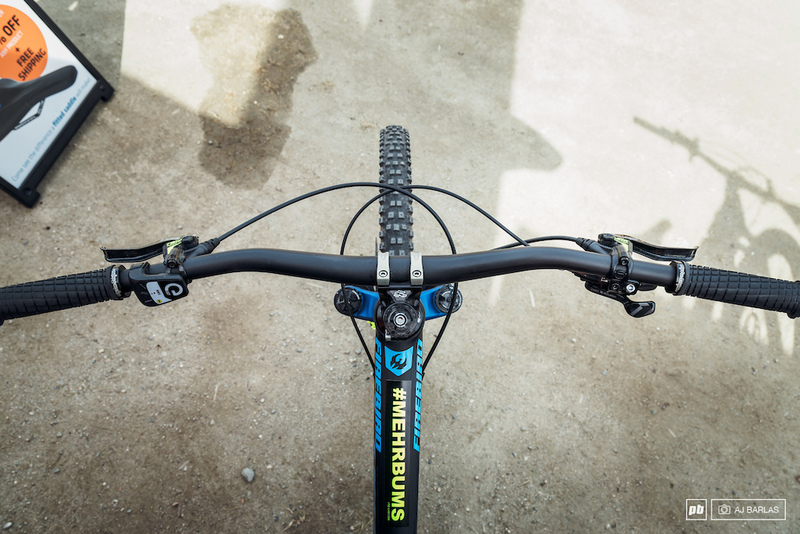 can you imagine that very first bike with a lefty fork!? it'd be such a mind f*ck to ride, 3/4 of a bike lol. it looks super sweet! Ironically a former rocket power parts rep just dropped off six new old stock rocket parts / scary fast skinsuits for me to put on ebay. dude...i've been wondering what happened to that brand! Remember seeing it in a mag mid/late 90's and thought it was such a cool name that I took scaryfast as my first email address eight or so years later! That said, I won't be going on the bay to buy one of your skinsuits. 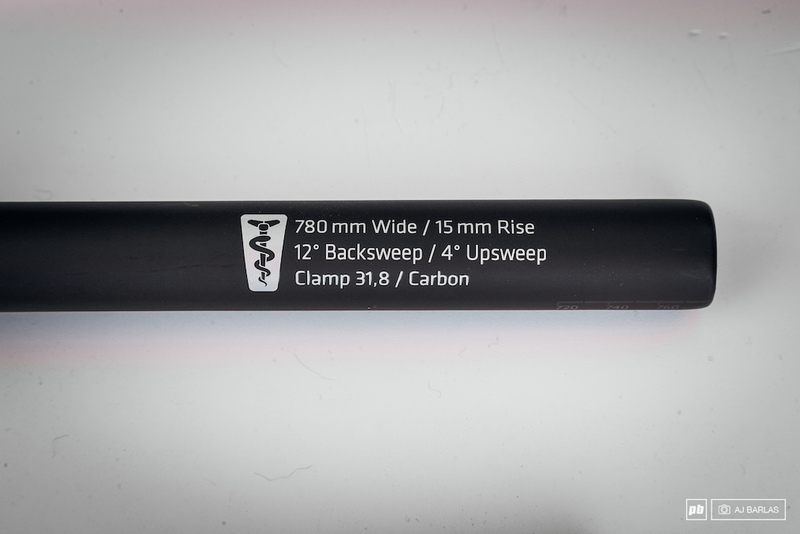 I am waiting to see 180mm side sweep saddles for guys with child bearing hips next....... marketing! 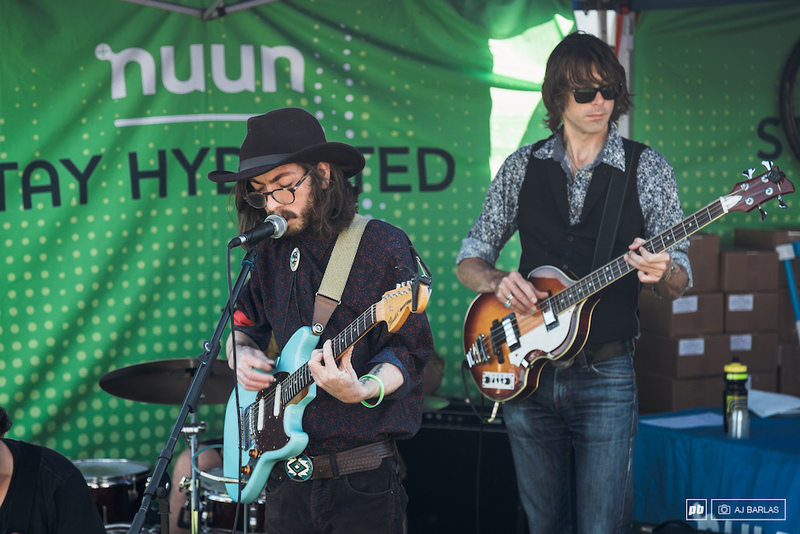 Props to NUUN for bringing the band. I have been using their drinks for about 7 years now. 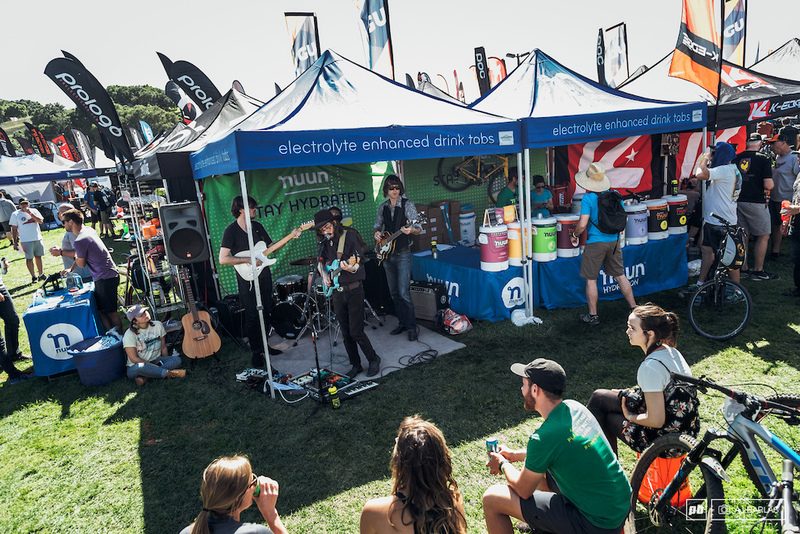 My favorite electrolyte option. 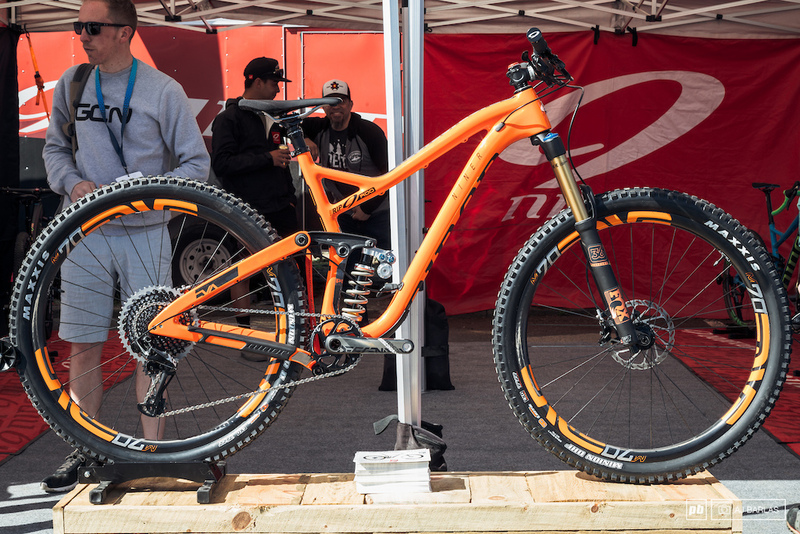 Anyone know the history of the GIANT branded Intense frame? 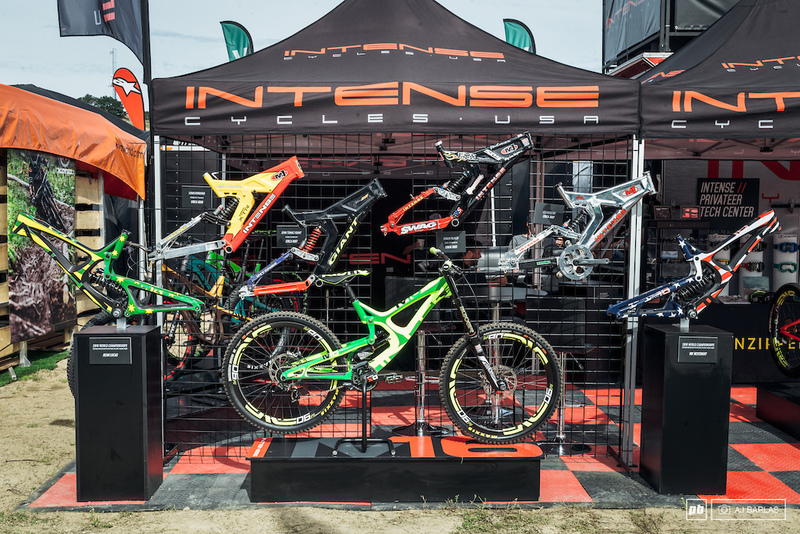 Intense offered their frames to many other brands. 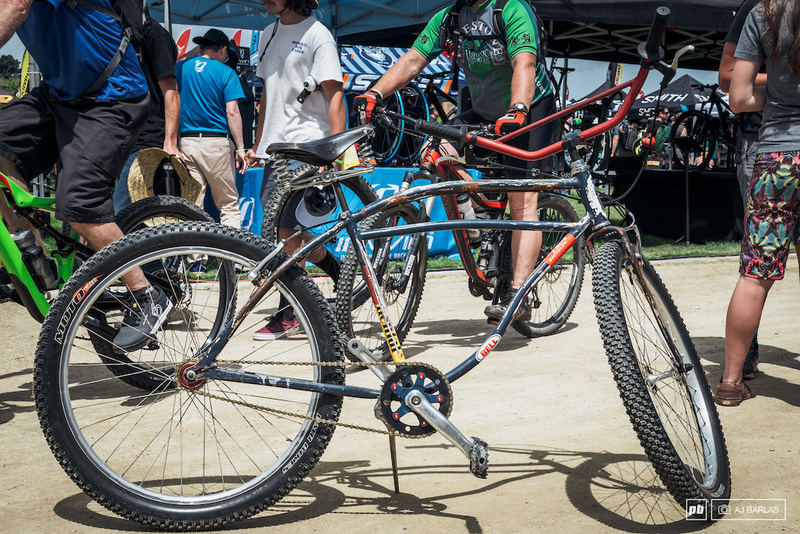 I also recall that the Mongoose/Lee Jeans team ran re-badged bikes from Jeff Steber. 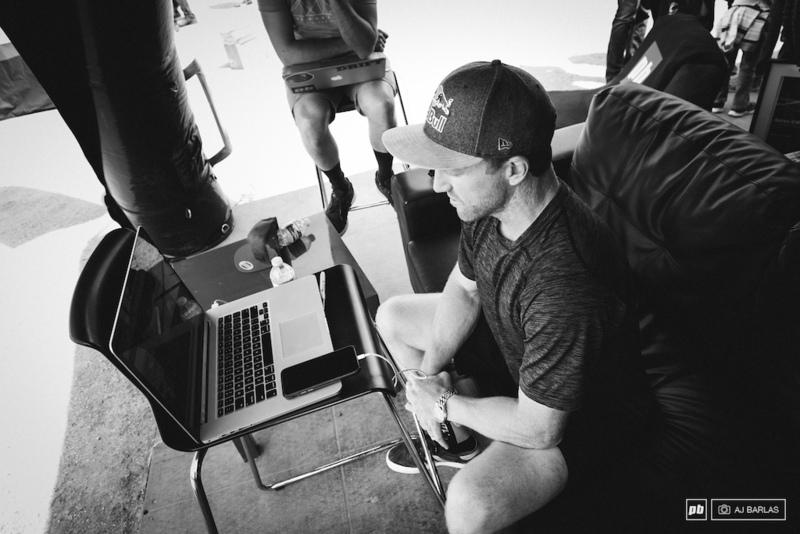 @Intense4life: Haro as well with Mike King. EVERY team rebranded the M1 for DH back then. About the only teams that didn't were Yeti and GT if I remember correctly. Huck 2 Flat my cro-mo beast. It's big mac approved so let's have a feast.